World Rugby U20 Championship 2019 - tickets now on sale! Purchase your tickets to watch the future stars in action in Argentina. New Zealand and Australia continued their build-up to the World Rugby U20 Championship 2018 with impressive victories over Fiji and Tonga respectively on day two of the Oceania Rugby U20 Championship. New Zealand and Australia continued their build-up to the World Rugby U20 Championship 2018 with impressive victories over Fiji and Tonga respectively on day two of the Oceania Rugby U20 Championship on Australia’s Gold Coast on Tuesday. The two teams will meet in the expected title decider at Bond University Rugby Club on Saturday, while Fiji and Tonga will attempt to win their first match of the 2018 edition and secure third place. 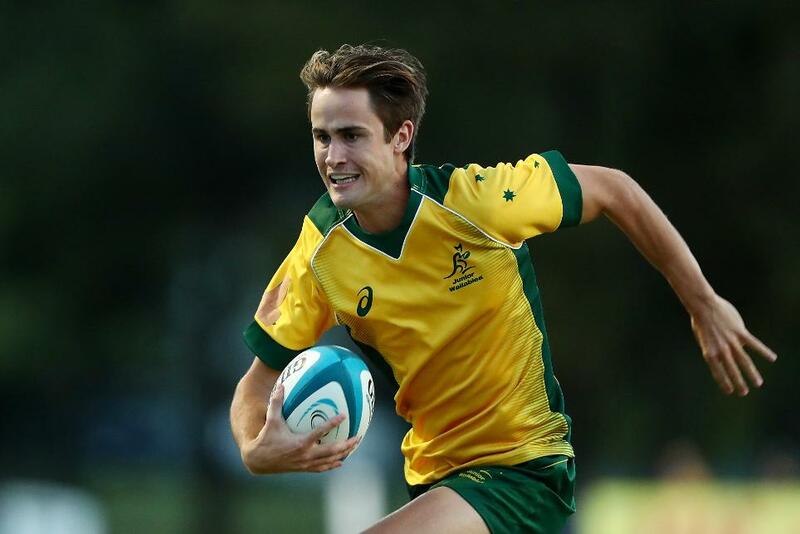 The Junior Wallabies ran in 15 tries in a 91-7 defeat of a spirited Tongan side with Australia Sevens squad member Matt McTaggert (pictured right) scoring four tries and barnstorming forward Trevor Hosea a hat-trick as the hosts’ greater experience showed. Number eight Josh Kemeny and replacement Will Harrison, who converted seven of Australia’s tries, also scored braces with James Ramm, Isiah Latu, Matthew Faessler and Hayden Sargeant also dotting down. Mafile’o Maka scored Tonga’s only reply. “The Tongan guys had a crack tonight but in terms of the standard of play those type of games can get a bit tricky and the little skills that win you good games you just have to be careful that you are still paying attention to them,” said Junior Wallabies coach Jason Gilmore. New Zealand, the defending Oceania and world champions, had earlier backed up their 97-0 victory over Tonga with a 55-15 win over Fiji, which was not as comfortable as the scoreline suggests after Billy Proctor was sent off for a dangerous tackle in the 20th minute. New Zealand were leading 10-0 at that stage, but were then forced to defend for long periods as Fiji tried to make the most of their man advantage. They were only able, though, to add a penalty and went in trailing only 15-3 at half-time. The defending champions upped the tempo after the break and Fiji, who will play in the World Rugby U20 Trophy later in the year, found it hard to live with them, but did manage to score two tries through second-row Liam Rasch and centre Ilikena Vudogo. Prop Sione Asi and captain Harry Plummer (main picture) both scored a brace for New Zealand with their other tries coming from Devan Flanders, William Tremain, Xavier Roe, Tanielu Tele’a and Jamie Sporwart.